(Nanowerk Spotlight) Separation and purification of bio-molecules such as proteins and viruses are important processes in the biotechnology industry. The risk of contamination with either known or unknown viruses in biological or therapeutic products require production processes that - ideally - completely eliminate the risks of virus contamination. Since the existence of very small amounts of viruses with a size of tens of nanometers causes severe damage to the entire bio-process, the filtration of viruses has to be pretty much perfect. Micro- and ultrafiltration have been successfully used in numerous processes as a robust step for virus reduction but they are not 100% effective. Currently used ultrafiltration membranes still allow smaller-sized virus particles to permeate into a small number of abnormally large-sized pores in the membrane. This broad size distribution of pores in ultrafiltration membranes and the low density of pores in track-etched membranes limit the practical use of virus filtration. "We have already successfully employed nanoporous films for the filtration of the common cold virus" Dr. Jin Kon Kim tells Nanowerk. "These membranes exhibit uniform sizes of pores due to the self-assembly nature of their fabrication but they have some limitations such as low mechanical and chemical stability in order to be widely used for effective virus filtration. For instance, they show many cracks after a filtration process at high pressure, say 0.4 bar; but a high filtration pressure is necessary to increase flux and effectively filter waterborne viruses." Kim, a Professor in the Department of Chemical Engineering, and Director of National Creativity Research Initiative Program for Block Copolymer Self Assembly at Pohang University of Science Technology (POSTECH) in South Korea, together with collaborators from other departments at the university, has now developed a new nanoporous membrane with good dimensional stability at higher filtration pressures, while maintaining high selectivity for the filtration of viruses. The scientists report their findings in the April 17, 2008 online edition of Advanced Functional Materials ("Virus Filtration Membranes Prepared from Nanoporous Block Copolymers with Good Dimensional Stability under High Pressures and Excellent Solvent Resistance"). "To achieve our objective, we designed a unique nanostructure where cylindrical pores with a vertical orientation are only located near the top and the bottom of a block copolymer film" Kim explains. "This vertical orientation of cylindrical nanopores near the top and bottom of the film is necessary for the effective filtration of waterborne viruses. But the middle part of the membrane exhibits a mixed orientation of cylindrical nanopores, that is, a combination of the parallel and perpendicular orientations. The mixed orientation of these nanopores in the middle provides much better mechanical strength – and thus dimensional stability – against hydrodynamic pressure compared with a nanoporous membrane whose cylindrical nanopores are only perpendicularly oriented." 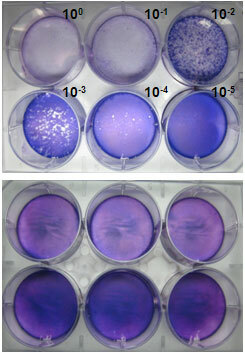 The process used by the scientists – selectively removing only PMMA homopolymer from a mixture of polystyrene-block-poly(methyl methacrylate) copolymer (PS-b-PMMA) and PMMA homopolymer by UV irradiation followed by rinsing with acetic acid – results in cylindrical nanopores with ∼17nm diameter and very narrow pore size distribution. To have effective filtration of the virus, such a uniform size distribution of nanopores is essential. 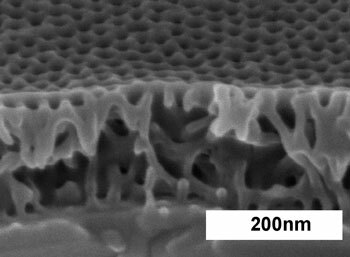 Although the packing of pores near the bottom of the film is slightly poorer than that of the top surface, the bottom of the film also exhibits vertically oriented cylindrical nanopores. However, the inner film shows quite different morphology compared with the top and bottom parts of the films. Kim mentions that this sandwiched structure of the film did not show any damage or crack even at a pressure of 2 bar, while high selectivity was maintained for the filtration of human rhinovirus type 14 which has a diameter of ∼30 nm and is a major pathogen of the common cold in humans. "Not a single virus was found in the plaque assay (the most important experiment for virus solution) after our filtration experiment, indicating that the nanoporous membrane employed in this study completely blocks all virus particles in the solution from penetration through the membrane. Finally, the nanoporous membrane showed excellent resistance to all organic solvents." Given the excellent mechanical properties, the POSTECH researchers consider that this membrane would be widely used for the filtration of viruses under very harsh conditions such as high temperature and acidic (or basic) solution.